Yesterday was a tumultuous day for politically-minded Americans. First came the shocking announcement of the sudden death of Supreme Court Justice Antonin Scalia. And then within a few hours of that news, we were confronted with another debate among Republican candidates for the presidency. The debate participants paid a short tribute to Justice Scalia, but soon moved on to rancorous disagreement. For many viewers the level of insults and name-calling made the debate unwatchable after the first hour or so. Surely this is not the way a democracy should elect its leaders. There must be a better model for giving opinions and navigating different ideas. Perhaps we can get some clues from the Supreme Court. Supreme Court, a man who was well-known not only to the legal profession, but also to the general public. Unlike many earlier justices, Scalia was not afraid to make his opinions known both inside and outside of the Court. He was an active and energetic participant in the Court activities and in his private life right up until the day before he died in his sleep while on a hunting trip in Texas. His bereaved family must still be struggling to accept the fact of his loss, and the our usual news commentators and reporters have been scrambling to write appropriate statements about his life and achievements. Many observers have suggested that Scalia might claim to honor the beliefs of the authors of the Constitution but that in fact many of his opinions changed accepted interpretations of the Constitution in a very activist way. The most notorious example was his support of changing the interpretation of the Second Amendment’s statement on the right to bear arms to enlarge its scope to include individual citizens as well as militias, which had been the standard interpretations for a hundred years. humane leaders setting forth the basic principles of democratic government. As the world and society changes, Justice Ginsburg believes that interpretations of the Constitution should not be bound by the 18th century meaning of words but rather by the deepest values of our ever-changing population. Perhaps it is almost inevitable that women would tend to take this view because it is difficult to believe that the Founding Fathers gave much thought to the rights of women of their time, much less to the challenges that women face in the 21st century. Antonin Scalia and Ruth Bader Ginsburg—two very different people with opposing ideas and yet they were never known to call each other names or to question the motives of their opponents. In fact, over the years, they became friends, visiting one another’s homes and families as well as attending operas together. Both of them had close, happy family lives and seemed able to enjoy social events even while they disagreed on many issues in their shared work life. Wouldn’t it be wonderful if more of our public servants and politicians could handle their differences as well as they did? So on this Valentine’s Day, let’s offer a Valentine wish to two colleagues who liked one another and who worked together for many years in a spirit of friendship that I am sure St. Valentine himself would approve. And let their lives be examples for all of us today—candidates, voters, and all Americans. Twenty years ago this month Ruth Bader Ginsburg became a Supreme Court justice and ever since then she has been making history. Her opinions, whether in agreement or dissent on a wide range of cases have kept the Court on an even balance over the years. Media pundits have been talking and writing about Ginsburg’s legacy and they often seem surprised that at the age of 80 she is still going strong in her demanding job. But there is one factor that no one has mentioned so far that might have improved her vitality and her long-lived success. She went to Cornell University, graduating in 1954, not too far off from the year I graduated from Cornell. In those days men far outnumbered women at the university, and one of the popular folk beliefs among the men was that coeds lost their good looks because they had to climb the hills of Ithaca to go to classes. It was said that our legs became too muscular and we looked more like athletes than “real women”. Well, Ruth Bader Ginsburg, and all of the women of our generation who are still alive and participating in the world, were probably strengthened by all that walking on those snowy hills. 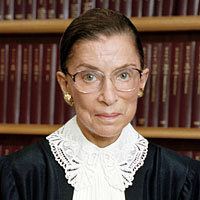 Justice Ginsburg regularly goes to the gym and is reputed to be strong and fit. Perhaps the world owes a vote of thanks to the good start she got on the hills of Ithaca. Of course physical vitality is only a tiny part of Justice Ginsburg’s many extraordinary attributes. She proved herself a brilliant lawyer and a staunch advocate of the rights of women and of all citizens to equal treatment before the law. Unlike some justices, she does not believe that the Constitution is an unchanging text set in stone, but rather a document written by humane leaders setting forth the basic principles of democratic government. As the world and society changes, Justice Ginsburg’s view of the Constitution is not bound by the 18th century meaning of words but rather by the deepest values of our ever-changing population. Let’s all wish Justice Ginsburg a happy anniversary of service and hope that she continues to add her valuable voice to the Supreme Court for many more years!